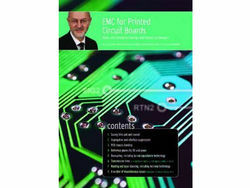 EMC for Printed Circuit Boards by Keith Armstrong BSc(Hons) CEng FIET SMIEEE ACGI. More than just a book. It is a true learning aid. Graphics in full colour. Written in a clear concise no nonsense style. Destined to become the standard for EMC PCB Design. This book is about good-practise EMC design techniques for printed circuit board (PCB) design and layout. It is intended for the designers of any electronic circuits that are to be constructed on PCB’s, and of course, for the PCB designers themselves. All application areas are covered, from household appliances, commercial and industrial *** Special offer 10% off until 30th April 2019, usual price £47.00 ***equipment, through automotive to aerospace and military. Some reviews for "EMC for Printed Circuit Boards"
"I use your book “EMC for Printed Circuit Boards” as a bible for my designers and am about to purchase another 5 copies, as the ones I bought have all been stolen!!" "Your book allowed me to suggest to (major car electronics manufacturer) better ways to lay out their in-car display controller that saved them $0.50 per unit." "I really like your books. They're very accessible and the 'EMC for PCBs' is full of good practical techniques and suggestions."